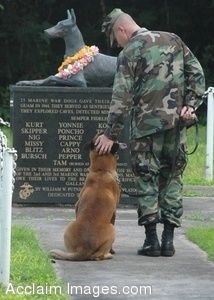 Description: Clip art photograph of U.S. Navy Petty Officer 2nd Class Blake Soller and his military working dog Rico pay tribute to the National War Dog Cemetery on Naval Base Guam Oct. 27, 2006. Soller is a K-9 handler assigned to Naval Security Force Detachment Guam. DoD photo by Mass Communication Specialist 2nd Class John F. Looney, U.S. Navy. Clipart photograph by Department of Defense Public Domain.